When building a home, often very little thought is given to the type of flooring and sub-floor structure used. Yet different sites need different materials, with some being far more appropriate for particular sites. The design of the rest of the house will also help determine the type of floor and sub-floor used. Your architect will have good ideas about the best flooring system to use, based on their experience with the type of building system you are using and the site specifics. But it helps to have a good understanding of the flooring systems available, so that you can consider the pros and cons of different systems and materials, and ensure that your sustainability or other requirements are met. So let’s take a look at the most common types of flooring systems (or, more accurately, sub-flooring systems), the materials most commonly used and the types of flooring materials they can support. A floor/sub-floor system must obviously be able to bear the entire load on top of it, potentially including the house, contents and occupants (some floor structures, such as upper floors, will only need to support the contents/occupants). The floor’s footing system must be suitable for the type of soil you have on your block. A soil report will be required which will tell you your soil type and how reactive it is. Reactive soils are soils with a high clay content which swell when wet and shrink as they dry. This expansion and contraction can cause structural cracking, sinking and other site issues. See www.bit.ly/2oKu9GC for a quick rundown of soil types. The level of insulation required for your home will also be a factor in the type of floor you select. If you are in a cold climate then you will need a highly insulated floor, so an insulated slab or a floor on stumps that can be insulated underneath will be required. Insulation doesn’t just mean thermal; you should also consider noise. For detached dwellings, noise transfer up through a ground slab is normally not an issue. Downward noise transfer from an upper level through a suspended slab to the lower level can be a problem, and underslab insulation can reduce this. The same applies to a floor on stumps—underfloor insulation will reduce noise ingress, especially if the insulation is acoustic grade. Of course, durability is also important: the floor must last the life of the home—for example, you don’t want to have to be restumping in 10 years due to degradation of the stumps or soil movement. Thermal mass must also be considered if your house design makes use of it. A slab provides high levels of thermal mass, although heavyweight walls (on the room-side of the insulation) tend to provide better thermal mass both in winter and summer than do concrete ground slabs. Other floor types can have thermal mass added using a number of methods, from thick ceramic tiles or slate, to adding PCMs (phase change materials). If you live in a bushfire zone then fire resistance will be an important consideration. With a raised floor, you don’t want materials that can easily combust, so a heavy steel sub-floor is a good option (lightweight steel subfloors can absorb heat, soften and fail). For an approach with lower embodied energy, a wooden sub-floor structure is suitable if the perimeter of the underfloor area is enclosed to provide fire resistance or the sub-floor is sheathed in fire-resistant material. Either way, storing ‘stuff’ under the floor in a bushfire area is a bad idea. Cost will also be a factor. Paying more won’t necessarily provide you a better performing outcome. What generally make floor structures more expensive are structurally challenging architecture, site slope and requirements for thermal insulation. The flooring in any home consists of the sub-floor system, the structural floor layer and any finished flooring material on top. We cover these separately below, but note that, in many cases, the line between the sub-floor and supporting floor can be blurry, and in some cases there is no line at all—they are the same thing. 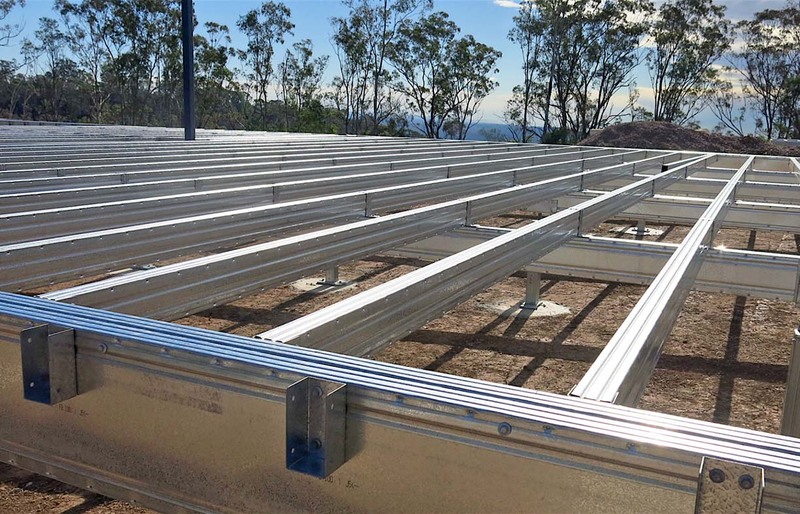 Lightweight steel framing, such as this Spantec Systems sub-floor, is not only termite-proof when used with steel wall and roof framing, but can reduce the number of footings required due to the ability to have wider spans between beams. Slabs are basically large solid expanses of poured concrete containing reinforcing materials such as steel mesh and reinforcing rods (commonly called rebar or reo). The slab can be a sub-floor and floor structure, with other flooring finishes laid on top, or it can be sub-floor, floor structure and floor finish if it is polished and finished with a clear or coloured lacquer of some sort. In slabs, the footings are generally integral to the slab. There are a number of different designs of slabs, depending on the site and soil requirements. There are many types of on-ground slabs. The simplest type consists of concrete stiffening beams poured into trenches around the perimeter of the slab, with the rest of the slab being at least 100 mm thick. With such a slab the footings are integral to the slab. The stiffened raft slab is a type of slab on ground, with additional poured concrete stiffening beams in the middle of the slab for extra strength. 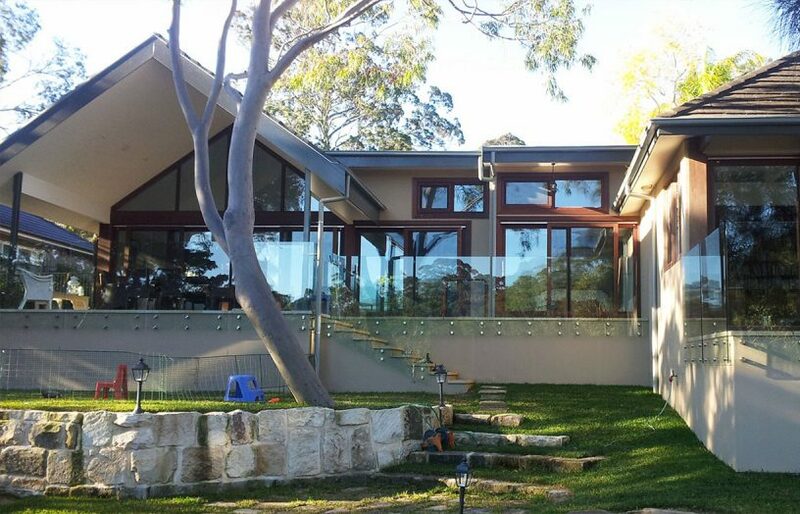 This is a common type of slab in Australia, required because of soil type (only the most stable sands can support a slab without the internal stiffening beams) or to support the house loads. Waffle pod slabs are suitable for flat sites and are formed by pouring concrete over polystyrene forms. This produces a slab which is fairly well insulated underneath and contains considerably less concrete and reinforcing than a stiffened raft slab. They are usually cheaper and simpler to install than other slab types, and so are popular in Australia. Waffle pod slabs can be used on soils that are moderately reactive, provided they include foundations via in-ground piers at regular spacings. However, with this requirement, the economy of waffle pods falls away. A variation on the waffle pod slab is the Cupolex polypropylene dome system, which uses an array of interlinking domes made from recycled plastic in place of polystyrene foam (see www.cupolex.com.au). Advantages include a high level of isolation of the slab from the ground, and the voids under the domes allow for utilities such as wiring and plumbing to be run after the slab has been poured. However, Cupolex slabs have only moderate insulation and thermal mass. The space under the domes can be ventilated to eliminate moisture problems, but air flow under the slab will reduce thermal performance both in winter and summer. Environmentally, the polypropylene domes may be more easily recycled at the end of the building’s life than the polystyrene foam in waffle pods, but both may end up in landfill as separation may be considered ‘too hard’. Pier and slab construction is used where more stability is needed due to reactive soils. Concrete piers are sunk below the slab—holes are dug at suitable intervals and filled with reinforced concrete before the slab is poured on to the tops of the piers. Suspended slabs are another variation on the slab theme. They differ in that they use reinforced concrete panels, cast in-situ or made off-site and transported to the site, which are lifted into place with a crane. They usually sit on supporting walls, so are used between storeys in a multi-storey building, or can be used as the ground-floor slab by installing short supporting walls—particularly useful for uneven blocks, as the supporting walls provide a flat and level support for the suspended slab. Some suspended slabs are solid, while some have hollow sections to reduce weight and allow the running of services through the slab. The level and direction of reinforcing materials in the slab depends on where the supporting walls are located. The primary advantages with slab construction are that slabs provide a solid, robust floor with a high thermal mass, making them ideal where passive solar design is incorporated to collect solar gain during winter. However, this thermal mass can work against you in several ways, including holding heat in a home once a cool change has pushed through and increasing lag-time of in-floor heating systems. Concrete also has a high embodied energy which should be accounted for, and it is also difficult to reuse at the end of the building’s life. There are some more environmentally friendly options with lower embodied energy, collectively often known as eco-concrete. These usually involve concretes where a good proportion of the Portland cement has been replaced with alternative materials, usually waste materials, such as fly ash from furnaces and power stations. For example, Boral’s Envisia concrete has 60% less Portland cement while actually performing better in some respects, such as reduced shrinkage and earlier strength gain. Wagner’s EFC (Earth Friendly Concrete) uses a mix of fly ash and furnace slag to completely replace Portland cement. See the Concrete and Cement Products Guide at www.mullumcreek.com.au/concrete-and-cement for a good list of products available, as well as discussion on the importance of avoiding structurally challenging architecture that requires a heavy reinforced concrete floor structure with the high embodied energy that goes with that. Some environmentally friendly concretes do away with Portland cement altogether, instead using other minerals, such as magnesium oxide. Magnesium oxide cement was developed by Novacem (which went into liquidation in 2012) and was previously available from TecEco, but this company is no longer trading. We haven’t been able to find any magnesium oxide concrete products, only building boards (plasterboard equivalents) using this material. Bear in mind that the majority of all Portland clinker consumed in Australia is manufactured here. Magnesium oxide products are entirely imported, so they have a high transport carbon footprint. Slab-edge insulation can be important to reduce heat loss from the slab in winter, as well as heat ingress from direct sun in summer. The other common sub-floor system is stump-supported. Stump-supported floors usually consist of a sub-floor of horizontal bearers (beams used in flooring are called bearers) that support joists (a smaller, closer spaced beam on which the flooring material rests). The bearers in turn sit on stumps which are adjusted in length (either by being partially buried, cut or even adjusted, in the case of adjustable screw-jack stumps) to all be level with each other. This makes such floors particularly useful when building on uneven or sloping ground. A structural floor layer is laid atop this supporting structure. This lightweight approach has the advantages of usually being lower cost and lower embodied energy than a slab, and is easier to build on a steeply sloping or uneven block. Further, plumbing and other services can be easily run along the joists. The materials used can vary. Bearers and joists are usually wood, steel or a combination of the two. Wood bearers may be solid wood such as hardwood, but these should be avoided as they are almost invariably from unsustainable forestry operations from local native forest. Better alternatives are sawn plantation pine of the required strength grade or engineered timber such as laminated-veneer lumber (e.g. CHH hySPAN, Wesbeam e-beam or Hyne LVL). Steel bearers are usually standard I-beam profiles cut to length before being galvanised and/or painted. Some steel systems consist of rolled sheet steel which is formed to make lightweight but strong bearers and joists. A good example of such a system is the Boxspan system from Spantec Systems, which comes complete with pre-punched screw holes, printed bracket locations and printed joist numbers next to each joist bracket, which correlate with numbers on each joist. Such a system can reduce sub-floor assembly time compared to a measure-and-cut system using standard-length materials. There are also composite materials that consist of wood top and bottom flanges separated by a galvanised steel webbing to form a composite wood/steel I-beam. However, the timber for some of these may be imported from unsustainable sources, so check wood sources. All bearer types have both advantages and disadvantages. Solid wood can be heavy, prone to warping, termite attack and mould/rot unless treated; although the design should ensure they are not exposed to water, either from outside (such as wind-blown rain) or from leaks from wet areas. Cold rolled steel is light and strong and has a long lifespan, but has a higher embodied energy than sustainably sourced timber. Hot rolled steel is heavy and requires cranes to install; it has a very high embodied energy, although steel is almost infinitely recyclable. Stumps are usually made from either treated timber, cast concrete or galvanised steel. All modern stumps have a long lifespan, and can be expected to last 50 to 100 years, or even longer. Some bearer and joist systems have matching stump systems from the same manufacturer, so if you choose one of those, the stump choice is made for you. 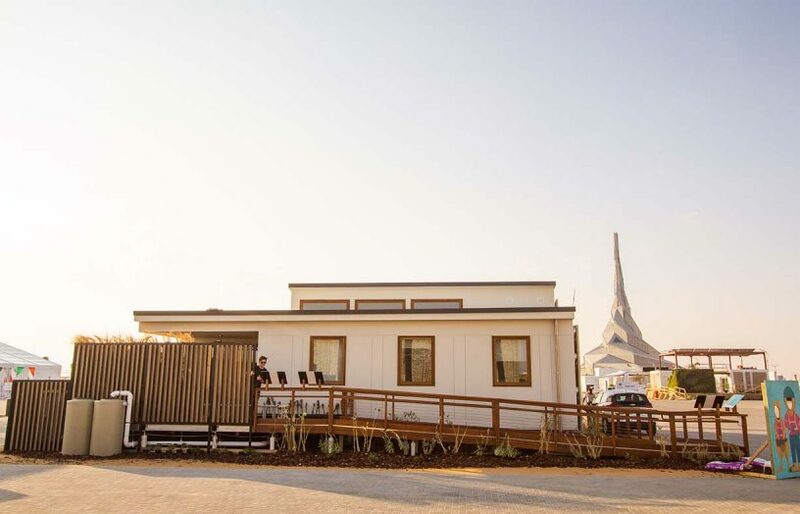 With the trend towards prefabrication of some or all of a home, prefab floors have also started appearing in domestic home projects. Bearer and joist systems can be provided in pre-cut lengths ready to bolt together, simplifying construction and reducing the build time on-site. Even faster installation can be had using pre-built floor sections (sometimes called cassettes), which usually consist of a steel or wood frame/joist system with a prefixed flooring material such as particleboard flooring screwed and/or glued into place. These can be particularly useful for multi-storey builds. Sitting atop the sub-floor is the structural floor layer, often called the floor substrate. This sits under the final finished flooring material. If you use a slab sub-floor, then you can skip this step as the slab is the finished supporting floor and doesn’t need anything else. For a bearer and joist sub-floor, you will need to add a structural floor layer. This may be tongue-and-groove particle flooring board, fibre-cement sheet, load-bearing wood or bamboo floorboards (some thin boards are meant to be supported by other materials underneath) or even more unusual materials such as reinforced AAC (autoclaved aerated concrete), such as Hebel PowerFloor. For a rigid, insulated floor, AAC panels like Hebel PowerFloor can be used. Here you can see how the floor is assembled, with the sub-floor structure over which the PowerFloor is glued, then the waterproof membrane, adhesive layer and final finish layer of tiles or whatever is desired. When choosing a timber structural floor layer (and timber joists and bearers as well), it’s important to consider the source of the timber. Wood may be sustainably sourced, but a lot isn’t. Even plantation wood (both hardwoods and softwoods are available from plantation sources) can have serious problems—after all, plantations may be located where a forest once (often quite recently) stood. However, where plantations are located on what was previously degraded/marginal open farmland (originally cleared for agriculture or mining), the environmental case in favour of plantation forestry is excellent. When looking at wood materials for your home, you want the best certified timber you can find, or to use recycled timber. The highest level of certification is FSC (Forest Stewardship Council). The Programme for the Endorsement of Forest Certification (PEFC) is also common, but it is less well-regarded on some compliance criteria by environmental organisations such as Greenpeace (www.bit.ly/2GhzMCy). Check the Mullum Creek guide for an excellent list of more sustainable timber options for both sub-floor and the structural floor layers: mullumcreek.com.au/materials. Bamboo has become a popular flooring choice due to its hardness and perceived eco-friendliness—you don’t have to kill trees to get it, it is harvested yearly and simply grows back. Some bamboo is of lower quality, being harvested too early or processed the wrong way. These issues may make it prone to damage from being too soft, or from warping and splitting due to moisture. Some cheaper bamboos may also have toxic glues that offgas toxic fumes such as formaldehyde. There has been some concern that bamboo is replacing hardwood forests in some areas of Asia, so make sure to ask for sourcing information for any bamboo products you buy. Also ask about potential VOCs (volatile organic compounds) from the glues used to bond the bamboo together, as well as from the varnish used on prefinished bamboo products. Similar issues apply for what is arguably the most common structural floor material—tongue-and-groove particle flooring board. This is available in various grades and thicknesses, but like regular particleboard is a combination of woodchips and a resin binder, all compressed to form a dense, structurally strong board. Check for potential VOCs from your selected material and also check for water resistance, especially if your floor covering may have potential gaps where water may penetrate underneath during mopping, for example. These sorts of particleboards can soak up water and will expand and become weak. This not only causes the floor to lift (which can be fixed by sanding and resealing if the swelling is minimal), but may result in rotting and mould formation. If you think this may be a problem, the particleboard can be given two or three coats of a waterproofing sealer before the final floor covering is laid down. Alternatively, specify a water-resistant version, such as the wax-impregnated version of CarterHoltHarvey’s Structaflor, which is also available in a termite-resistant version, eliminating that particular problem for your floors. Structaflor is made only from plantation pine and contains no native forest materials, and there is even a thermally improved version called R-flor which has a higher R-value than the standard version. However, Structaflor is not the perfect flooring board as it only meets E1 emissions levels for formaldehyde, not E0 or Super E0. If your house is built on a slab, then obviously you have solid concrete floors just waiting to be finished, but you can get a structural cement or concrete floor layer in other ways. One interesting material is Hebel PowerFloor. This consists of 75 mm thick autoclaved aerated concrete (AAC) panels with an internal reinforcing structure. This allows it to be used directly on top of joists for ground and middle floors (floors between storeys), and it can be directly covered with any floor covering you wish, including lino, carpet, tiles or timber. The main advantages with this sort of material is its inherent thermal and acoustic insulative qualities and its rigidity, which prevents movement and squeaking that you get with wood-based materials. It is also very fire-resistant compared to many other materials. One downside is the thickness—at 75 mm it adds considerably to the thickness of the floor, so this must be allowed for in the design; this makes it less suitable to use as a retrofit over an existing floor substrate. 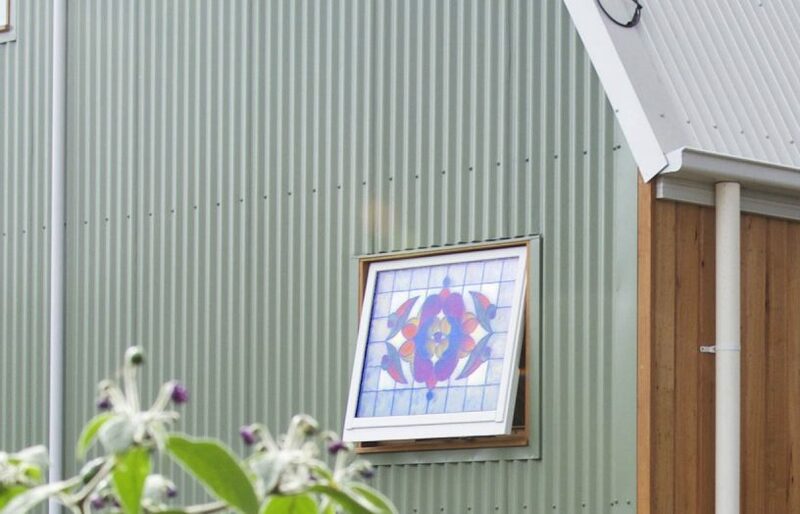 A thinner but still non-wood alternative is fibre-cement sheeting. This is similar to cement sheeting used for wall cladding, but is thicker and stronger and can be used as a load-bearing floor directly. One example is BGC Durafloor, which can span 450 mm joist spacings and is 19 mm thick. It can be used as a floor substrate under flooring materials such as tiles or carpet, or can be used as a floor itself, and is particularly suitable for use outdoors and in wet areas. There are other manufacturers with similar products. Tongue-and-groove particleboard is a popular floor substrate material as it is relatively low cost, strong and durable. 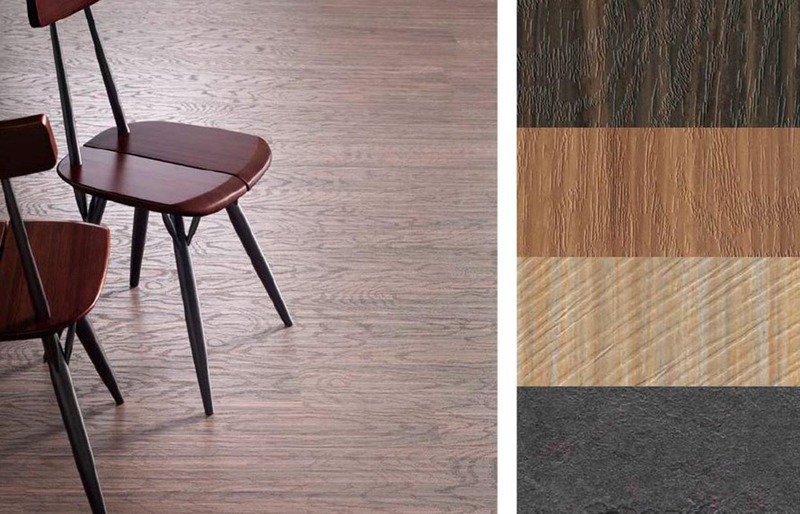 The three common sizes of CarterHoltHarvey’s Structaflor shown here are 19, 22 and 25 mm thick. It is also available impregnated with wax to make water-resistant and termite-resistant versions. It is made from plantation pine; no native forest products are used. The final flooring surface that you walk on can be made of many things and, as discussed above, where the sub-floor/structural floor layer ends and the finished floor begins can be a blurry line. In some cases, you’ll just be finishing the structural floor layer; in other cases, you may be adding a hard or soft covering. If you have used a concrete slab, then you can simply coat the slab in one of many varnishes or flooring coatings available. These range from water-borne polyurethanes and acrylics, to epoxies, either with or without added materials to improve grip and change the look and feel of the finish, and even simple oils. A simple, low-maintenance finish is a plain clear varnish, which shows through the natural colour of the concrete. Concrete is easily coloured using oxides, so if you are planning a polished concrete floor and don’t want just plain concrete-grey, then ask your concreter what oxide colours they can provide. Concrete floors don’t even need to be polished before coating; you can go for the ‘as laid’ look, which should be quite smooth if the concreter has done the job well, but can also be textured if you request it. If you decide to have polished floors, this involves grinding away the top surface of the concrete to form a completely flat, smooth surface, which also exposes some of the aggregate materials inside the concrete. This adds a more interesting look, but it can be expensive and time-consuming. Similarly, if you use wood or bamboo floorboards for your floor structure, the obvious step is to varnish them to provide the final finish. Some boards, especially bamboo boards, come pre-finished, so you just need to lay them into place. In older homes it is not uncommon to find beautiful hardwood floorboards covered with carpet or vinyl—a mistake in many people’s eyes. For a different look you can varnish tongue-and-groove particleboard sheeting. This eliminates the need for yet another layer of material and gives an interesting effect of its own, a little like cork flooring. Whether coating concrete or timber, or another flooring covering such as cork, make sure to consider VOCs and the sustainability of the materials used in your floor coatings. See the Eco-Paint Buyers Guide in ReNew 136 for more information on VOCs. One option with a slab is to add a top screed layer over the concrete for the final desired finish. This also enables the addition of electrical resistance elements or hydronic heating pipes into the screed, so these don’t need to be in place when the slab is laid. Sometimes, thin floorboards may be laid on top of a concrete slab to provide the feel and look of wood while still taking advantage of some of the thermal mass effect of the slab. However, the two materials have different coefficients of expansion, so in this case the floorboards are best done as a floating floor, where the boards are attached to each other but not the sub-floor structure, instead sitting on a layer of underlay. There’s a simple DIY guide on laying a floating floor at www.bit.ly/2FJenqd. Covering particleboard with polished floorboards is also an option. This has the advantage of the nice finish of wooden (or bamboo) floorboards while eliminating draughts between boards that are so common with floorboard floors that have no underlying floor substrate layer. Other options for hard flooring which can be added over all sub-floor types include ceramic tiles or slate (ideal for wet areas and kitchens) and stone tiles (thin sections of stone cut to tile-like thickness). How much usable thermal mass these add depends on the material and its thickness, but thin coverings are quite limited in their thermal storage capacity compared to, say, a concrete slab. Heavy stone tiles such as marble and sandstone are very hard-wearing but can have debatable environmental credentials which can be hard to verify; these depend on the source of the stone and how far it has been shipped—a lot of stone originates on the other side of the world, so it has very high transport miles associated with it. There are other interesting products such as Royal Oak Floors Concreate slab tiles (see www.royaloakfloors.com.au/concreate), which consist of a tongue-and-groove wood panel finished with a thin layer of concrete which is prefinished, oiled and polished. The panels are suitable for gluing onto new floors or retrofitting over any stable sub-floor, including existing wooden floors. Note that while such systems will give you the look of concrete, they won’t have the thermal mass effect of a solid concrete floor. Linoleum is available in a huge range of colours, patterns and textures, such as the woodgrain and slate texture finishes shown here, from the Marmoleum range from Forbo Flooring Systems. Lino is also available in rolls or tiles of various sizes, so almost any desired effect can be achieved. Even better is that lino is made completely from natural materials such as linseed oil, wood flour, tree resin, limestone and natural pigments, so no toxic off-gassing occurs as it does with synthetic materials such as vinyl. Other hard floor options include various laminates, often made from compressed fibre boards with vinyl or other coatings; many of these are of unknown quality, durability and environmental sustainability, and may off-gas considerably in the first year or two. Some laminates are much better than others, so do your homework if you go down this path. Of course, there are also softer floor coverings that can be used on any structural floor layer. The obvious option is carpet, which comes in different materials such as synthetic fibres (nylon, polypropylene or polyester, all of which are hard-wearing and stain-resistant, but an environmental problem at end of life) and wool (a natural fibre but you need to consider its ethical credentials; it can also stain easily). One advantage of wool carpets is fire resistance—wool won’t support a fire on its own, whereas synthetics and other fibres may. Wool can also be composted at end of life, provided it is a pure wool blend with no synthetic fibres in the tufts or backing. A variation on carpet is carpet squares or tiles, such as the Heuga Interface collection (www.interface.com). Carpet tiles allow tiles to be replaced or rotated for more even wear and a longer lifespan. And don’t forget carpet underlay. Some carpets have underlay built in, so check what it’s made of to avoid buying a natural carpet with a synthetic underlay. For floor coverings that don’t have an integrated underlay, try to select a natural material if available, such as Airstep natural rubber. Woven coir, sisal, jute and seagrass are also available and are natural materials that will simply compost at the end of life. However, they can be harder to keep clean than synthetics and will generally have a shorter lifespan in high traffic areas. Another option that is similar to but softer than a ‘hard’ flooring material is cork. Cork is the bark of the cork tree, which is removed from the tree without killing it, causing it to grow back over time. A lot of cork tiles and flooring are now made from recycled cork, so your flooring may already be on its second use when you buy it. Once installed (installation depends on the type of cork flooring you buy), it should be sealed with a polyurethane sealant to protect it from stains and scuff marks. Furniture legs will damage cork flooring and should sit in felt-bottom furniture cups. Also in the semi-soft flooring category are of course vinyl (we don’t recommend this due to the high level of off-gassing of plasticisers) and the natural equivalent, linoleum, which is made from mineral powders, linseed oil, cork or wood dust and pine resin as a binder. Colour pigments are also usually natural materials and linoleum is almost completely biodegradeable. Rubber flooring, while not as common as the others mentioned above, can be very durable and give a nice finish, while feeling warmer underfoot than hard tiles. It’s generally a natural material made from latex and is biodegradeable, provided it is made from natural rubber not a synthetic. There are several brands, including a composite cork and rubber material called Comcork (www.comcork.com.au) which is around 70% cork and is available in smooth or textured surfaces for higher grip levels, and Regupol Everroll (www.regupol.com.au/everroll), made from pre- and post-consumer waste rubber. One part of many newer floors is integrated heating. This can be in the form of a hydronic system, using an array of pipes, or it can use resistive elements, usually in the form of resistive wire or sheet film. Hydronics are usually laid in slab floors, either in the slab itself, or added to the top of the slab in a suitably thick screed layer (an extra layer of concrete added after the slab is complete). The pipes are laid into the final positions, usually divided up into zones so that only particular areas need to be heated if desired, and the concrete poured around them. Obviously, the pipes must remain leak-free for the life of the slab, so only pipework and fittings designed for in-slab hydronics should be used and it should be installed by someone trained in that particular system. Fixing leaking pipes in a finished slab can be expensive and messy! Resistive underfloor heating can be added under any floor surface or covering due to the simplicity of the material. It consists of either thin wires or thin sheets of heating elements laid under tiles, carpet or whatever flooring finish you decide upon. Resistive heating systems are cheaper than hydronics to install, but a big disadvantage is that they can use a lot of energy, and so can be very expensive to run. In-floor heating when done with a slab has one major disadvantage—there is considerable thermal lag as the slab takes time to heat up. 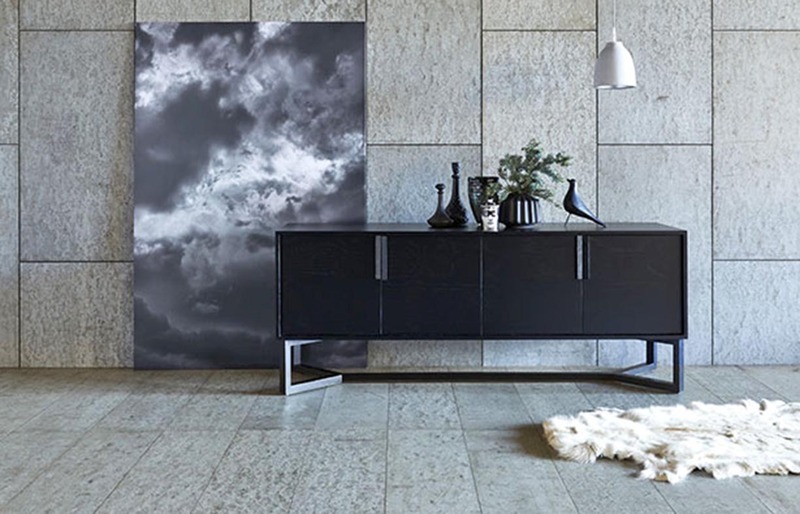 So, if your climate is prone to rapid changes in temperature, and particularly if it has long shoulder seasons for heating (so you find yourself regularly wanting to turn space heating on and off), heating the slab may not be your best option. You may be better off having the heating system thermally isolated from the thermal mass of the slab (for example, using heating film on top of rigid insulation, topped by your chosen floor covering; but bear in mind that resistive heating systems can use a lot of electricity and are usually expensive to run), or using a different heating system altogether, such as reverse-cycle air conditioning or far-infrared panels. Concrete tiles are available for both walls and floors and provide a polished concrete finish without the need for a concrete slab. They can be retrofitted to any stable floor. 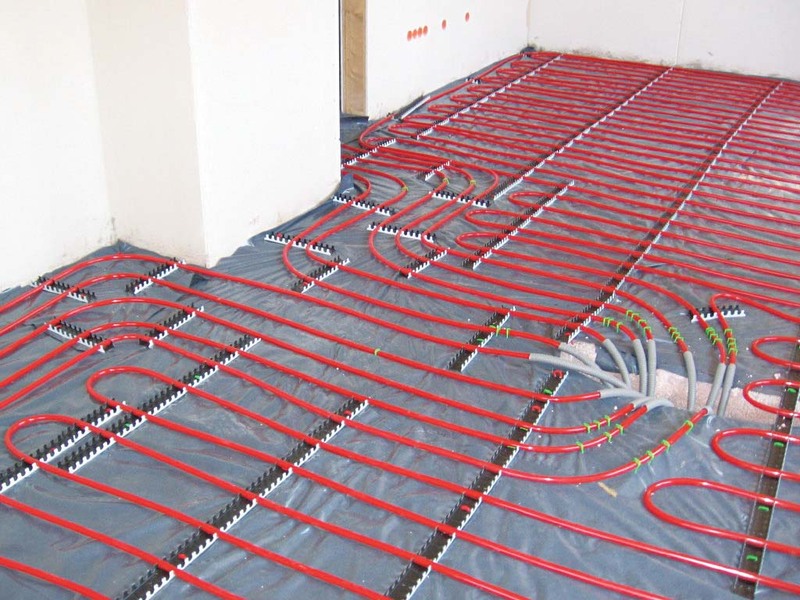 If you do decide to install in-slab heating, you must make sure that the slab is fully insulated, underneath and around the edges, otherwise you are paying to heat the ground under and around the slab! Some types of flooring, such as floorboards, tend to have problems with draughts if they are not well installed. As mentioned earlier, a floor will be far less draughty if floorboards are laid over another material such as particleboard flooring. If boards are laid directly onto the sub-floor structure then they should be sealed between the boards or sealed underneath using an appropriate sealant. A spray-on insulation, such as SprayIT Solutions, is economically viable for new and existing suspended timber floors and will both insulate and seal in one go. It is also important to seal around the edges of the floor, regardless of the type of floor, to prevent draughts getting in between the edges of the floor and the walls, under the skirting boards. This should be done as the house is being built, but like the problem of wall and ceiling insulation being incorrectly installed by builders, sealing floor-to-wall gaps is often not done correctly, or at all. In many areas, particularly cooler climate zones, considerable thermal performance improvement to the building envelope can be had with a good degree of thermal insulation of the floor. For bearer and joist floors this can take the form of rigid batts fitted between joists, foil and composite foil/bulk insulation materials stapled or fitted between joists or under joists (in the case of sheet materials) or even spray-on foam materials. Regardless of the material used, it needs to meet several important criteria, including flammability resistance and vermin resistance, and it must be installed in a way that it won’t move over time. For this reason, soft batts (like wall and ceiling batts) that are held in place under a floor with strapping or mesh are not recommended. There are similar materials with embedded reinforcement designed specifically for flooring uses, such as Earthwool Underfloor, which has an integrated wind wash barrier (to prevent wind damage to the batts). A more involved system involves creating an insulated floor cavity. For example, you might lay a 12 mm thick structural plywood substrate over the floor joists, fit 70 to 90 mm deep pine battens over this at standard centres, and insulate the floor cavity between these battens with Earthwool or polyester batts. Floorboards are then laid over this. The result is a well-insulated floor with no draughts, a handy services cavity and no vermin access. For slabs, whether you have insulation under the slab or not depends on your location. A slab that isn’t insulated will effectively mirror the temperature of the ground at a depth of around three metres. In climates with huge diurnal fluctuations that for much of the year oscillate near equally to either side of the desired internal temperature, this lets you use the relatively stable temperatures of the soil to stabilise the temperature inside the house. In colder regions (areas with colder winters), it is advantageous to insulate the slab as the ground temperature is simply too cold in winter for comfortable living. This is especially the case for passive solar homes which are designed to store heat from collected sunlight in the slab. In cold regions, uninsulated slabs simply leak heat into the soil, losing most of the collected warmth. Again, whether the slab is insulated or not depends on several factors, including your climate, but also the rest of the house design. This is something that needs to be discussed with your architect. Waffle pod and similar slab systems provide insulation under the slab, but if your plan is to eliminate the use of plastic foams or similar products, then you can still insulate under the slab using natural materials. One such insulative material is ClinkaFILL, an aerated clay aggregate that can be used under and even inside a slab to improve thermal performance. While insulating under the slab decouples the slab from the ground temperature, an often-overlooked area is the edge of the slab, where considerable heat can be lost (or gained in summer). The edge of the slab should be insulated using appropriate insulating materials—there are products specifically designed for this task. 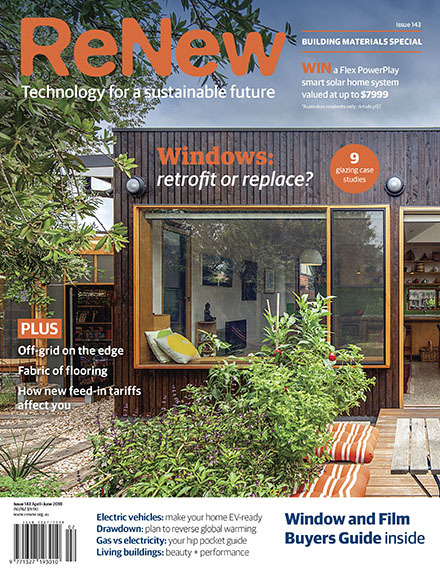 For more information on slab edge insulation, see ‘Avoiding unseen heat loss’ in ReNew 138. The Mullum Creek project has also produced a slab insulation guide: www.mullumcreek.com.au/app/uploads/Ground-Slab-Insulation-Guide.pdf. Thermal mass can be an important part of a passive solar home. In a well-designed home, thermal mass can store heat from sunlight during winter, keeping the home warmer in the evening for longer and providing a higher average temperature through colder months. We have mentioned concrete as a source of thermal mass, but other high mass materials that can be used in this way include stone, bricks and heavy tiles. As previously mentioned, heavyweight walls (on the room-side of the insulation) can provide good thermal mass, so consider this as an alternative when using a lightweight floor. For homes with lightweight floors, you can use phase change materials, which store warmth as latent heat in materials that undergo a phase change (from solid to liquid—i.e. they melt) at a temperature that is comfortable for the house occupants, usually in the range of 18 to 28 °C. These materials may be organic, such as based on waxes or solid oils, or mineral based. The material is encapsulated in plastic membranes, forming a sheet of small cells of the PCM material, allowing them to be used in walls, ceilings and floors. A hydronic system is often an integral part of a slab floor. Here a system is being added to the existing slab. The pipes are laid and a screed of concrete is poured over them. Phase change materials can be used immediately under many flooring types, including floorboards, fibre-cement sheet and similar supportive materials, but there must be a high level of insulation under the PCMs and a high degree of thermal coupling between the PCMs and the flooring surface. This coupling can be difficult to achieve, depending on the degree of contact between the layers, and the thickness, density and hence conductivity of the floor material. Summary tables of both sub-floor systems and flooring materials are available here. Does it suit your block’s type of soil and location? Does it suit the rest of build? e.g. heavy materials require a solid sub-floor. Does it have the required termite and rot resistance for your location? Is it suitable for the area in general? e.g. coastal or tropical regions. Is it within the build budget? Do you need high thermal mass? If building a slab floor, should it be coupled to the soil or not? What level of underfloor insulation is required for your location? Does it meet the sustainability and recyclability criteria for the project? What level of durability and maintenance is required? How critical to you is the use of natural materials and sustainability, recyclability and biodegradability? What level of stain resistance and ease of cleaning is required? e.g. textured hard floors, especially textured vinyls, can trap dirt and require extra effort to clean. Is it suitable for the specific area in the house? e.g. wet areas and kitchens, where spills are frequent, require materials that are waterproof and easy to clean. Should the materials feel warm or cool underfoot? Should the flooring feel soft or hard underfoot? Are the materials suitable for in-floor heating, if required? Does the material have the desired level of reflectivity? e.g. reflective tiles may produce glare if sunlight hits them directly. How fire-resistant is the material? Consider longevity of the style.